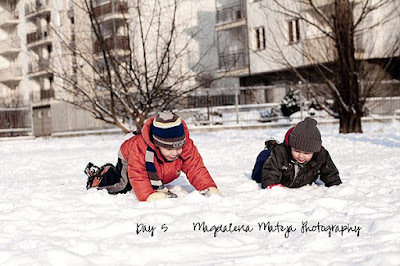 Another day on snow, this time both kids were playing (Maciek is going to the kindergarten only 3 times a week, other two we spend together). One very important thing happened today but I didn't have idea how to capture it on a photo. During dinner Maciek (he turned 3 in December) asked me first how vegetables grow (carrots, broccioli and cauliflower) and his next question was "how the meat grows". Well, I don't want to lie to him so I told him that we get meat from animals. "what kind of animalis?" I told him chickens, cows and pigs. "and what about bees, do we get meet from bees?" I was in heaven, I could start talking about honey and how bees make honey and I didn't have to tell him how it happens that animal give us meat. He's so smart and he asks many difficult and very logical questions. I was affraid that question about meat will be asked soon because lately he was looking at meat in a strange way. I'm glad I didn't have to tell him more about meat, I wasn't prepared for that even though I expected that question. He's too young for questions like this I think. If anyone reads it, tell me, how your kids reacted when they knew where's meat from? I'm affraid Maciek will stop eating meat when he knows the truth, he's so sensitive.